Keep hunting interesting with these smart tips! 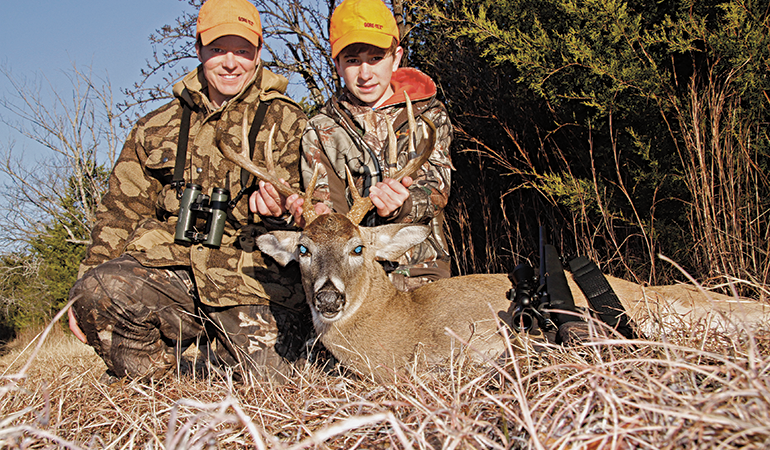 How cool would it be if your child shared your passion for chasing whitetails? Instead of driving to track meets at 5 a.m. on Saturdays, you could drive your protégé to the woods, discuss tactics, have a great time, and maybe kill a big one that you’d talk about for the rest of your lives. If your child could experience the same exhilaration that you feel in the woods, you’d have it made. Reality is, no two kids are the same. Nature and nurture form kids into the people they become, and school, sports, and friends exert an awfully strong pull. So there’s no blueprint for forging a hunter out of your son or daughter. Some may never be. I believe there are some things you can do—and some you shouldn’t—to fan the deer fever that may be waiting in your beloved. First—and this might shock you because this is a whitetail column—deer probably aren’t the best intro to hunting. In the late 1970s, Robert Norton, PhD, and Robert Jackson, PhD, at the University of Wisconsin conducted a study that identified five stages of hunting. Stage 1 is the Shooting stage wherein new hunters are most interested in the capabilities of the gun in their hand. They love to shoot. Stage 2 is the Limiting Out stage. Here novices are most satisfied after they reach a legal limit of game. Stage 3 is the Trophy stage. Stage 4 is the New Methods stage. Stage 5 is the Sportsman stage that is more about enjoying the experience with friends and family than it is about killing. Deer hunting effectively skips the first two stages, so most kids are better off shooting, tromping, sneaking, and learning the woods via small-game hunting. But let’s assume your child is ready for deer hunting. Here are a few good tips to employ. First, consider foregoing a blind or treestand. Sneaking to a few good spots in the woods is a lot more fun for a kid, despite the odds being much lower for actually taking a deer. This brings me to another point. It’s a misconception to think that a child must kill a deer the first time he or she goes out or else they won’t return. I’ve seen well-intentioned adults coddle their young hunters so that they don’t feel the slightest bit of cold, hunger, or even effort in killing a deer on their first hunt. But most kids don’t equate fun with killing on their first hunt unless that’s what you tell them. Rather, fun should mean interesting. And it shouldn’t be too easy. Think about it. Did you kill a deer on your first hunt? If not, did you give up or did you want to go try again? Were your senses not heightened as you felt the slight sting of cold in your fingers and wind on your face? Most hunters I’ve interviewed say it took them several fun and frustrating seasons before they bagged a buck. It was this challenge—the focus and effort spent in accomplishing a goal—that pulled them back to the woods. It’s precisely why your kids play video games. They play them to win. If they won on the first try, they wouldn’t play them anymore. I believe hunting should challenge children, not coddle them. Yet it shouldn’t be torturous, either. 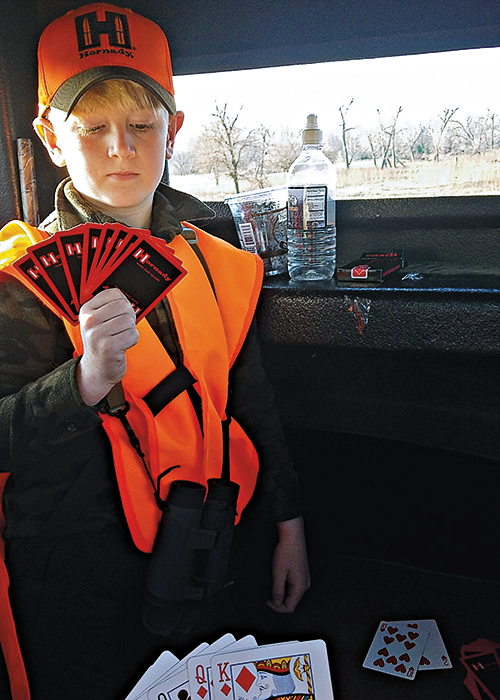 Hornady’s Neal Emery knows the task of introducing kids to hunting all too well. His eight-year old son, Weston, started hunting with Neal when he was just six. He took his first deer a year later. Unsurprisingly, Neal says that Weston didn’t have much patience back then. So what did Neal do when Weston said he was bored? And that brings up a great question. Is it okay for young hunters to bring along toys to the woods? The hunting community is split.“We go deer hunting to enjoy the outdoors, not video games,” said Thomas Pennington, whose two sons became avid hunters. On the other hand, there are others who say it’s fine to bring along a gadget if it helps the child stay out longer and see more deer. Capt. Bob Weatherald owns Maryland’s Mid River Guide Service. His son, Dawson, has been helping his father guide clients since he was waist-tall. “I believe it’s all about showing enthusiasm and excitement for an unpredictable adventure,” said Weatherald. This means sharing stories with them, talking about the mounts on your wall, studying animals, and talking tactics and gear like regular hunting buddies. Weatherald also believes your child should accompany you on your hunt rather than the other way around. That means you don’t necessarily have to change your style of hunting just for a kid. Take them along so they can learn how you do it. This might mean buying a two-man treestand. If you hunt from ground blinds, that’s fine, just make sure he can see out of it. Regardless of where you hunt, give your charge a job, whether it’s using the binocular to spot, wrangling the dog, or blowing a grunt call. Let a kid collect a memento or two to bring to grandma. Finally, let Jack or Jane shoot a small deer if they want. Encourage it. Now’s not the time to teach trophy hunting; they’ll pick that up soon enough. Then make them get their little hands dirty by helping you clean the deer. Most kids are fascinated by deer guts. They’ll learn biology and shot placement and that hunting comes with responsibility. Most importantly, relax when you hunt with your kid. It doesn’t matter if you kill a deer, as much as that you do your best to make the hunt interesting. Your child will sense your ease and will be more apt to have a good time, too. After all, isn’t that your ultimate goal?